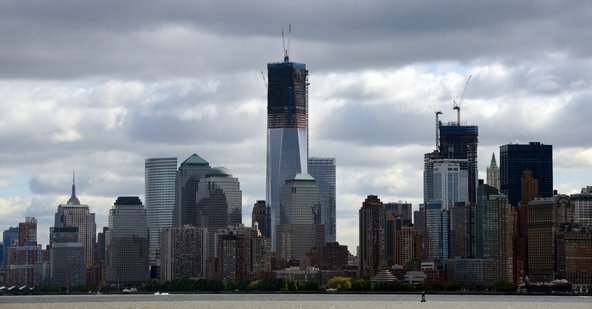 NEW YORK — By Monday morning, the newest skyscraper rising from the site of the Sept. 11, 2001 attacks is expected to be the tallest building in New York’s skyline. The tower at One World Trade Center, at 1776 feet — or 541 meters — and 104 floors, will be 403 feet taller than the twin towers it is replacing. When finished in 2013 or 2014, it will be the tallest building in the Western Hemisphere. The tallest building in the world will remain Dubai’s Burj Khalifa in the United Arab Emirates, at 2,717 feet. Next week could be a moment of triumph for Americans who, one year ago, were celebrating in the streets of Lower Manhattan and Washington, D.C. when President Barack Obama announced that Osama bin Laden, the mastermind behind 9/11, had been killed. Facing an onslaught of criticism from Republican rivals who try to paint him as a lightweight celebrity, the Obama White House and campaign are engaging in a media blitz meant to remind everyone who has been calling the shots on foreign policy. Mr. Obama’s aides enlisted former president Bill Clinton to narrate this web ad that suggests that Mitt Romney, the presumptive Republican nominee, would not have pursued the Qaeda leader as aggressively. Mr. Clinton’s involvement in this ad reminded many of the fierce primary contest four years ago when Hillary Rodham Clinton, now Mr. Obama’s Secretary of State, questioned his foreign policy credentials in her own national security ad. As Peter Baker and Michael D. Shear note in the Times, the president has actually been talking about Bin Laden for months — including in his State of the Union address. Only now the intensity has changed. Mr. Obama will be on national television on Wednesday, the anniversary of Bin Laden’s death, doing part of the interview in The Situation Room. The president’s aides have been interviewed for a Time Magazine special report, and there’s much more. “Barack Obama is not only trying to score political points by invoking Osama bin Laden, he is doing a shameless end-zone dance to help himself get re-elected,” Mr. McCain said. Romney campaign spokespeople accused the president of trying to divide the country. Usually disciplined and on message, Mr. Obama rarely raised the issue, but when pushed he has reminded foes that he has tackled some big challenges. No doubt the White House’s attempt to capitalize on the anniversary of the Bin Laden death is meant to counter the Republican message that Mr. Obama has been an ineffectual and incompetent president who is out of his depth. Normally, an April with the presidential candidates already decided, might slip into the political doldrums for a while. Not this year. Before the Republicans define the president in their terms, the Obama camp is trying to make it clear that he did accomplish some big things, despite the enduring economic malaise and the health care overhaul that is far less popular than they had expected. Vice President Joseph Biden Jr. gave a speech saying that the re-election slogan would be “Bin Laden is dead and General Motors is alive,” referring to the car-company bailout orchestrated by the administration. Mr. Obama’s opening salvo of his re-election campaign should not have caught Republicans by surprise. On Thursday night, Mr. Biden told an audience at New York University that Mr. Romney and the Republicans had ideas that were from another era. Of course, the danger of trumpeting foreign successes is that between now and the election in November there are any number of foreign challenges that could explode. This entry was posted in NEW YORK TIMES BLOG and tagged Freedom Tower, Osama bin Laden, World Trade Center by FRANKIE EDOZIEN. Bookmark the permalink.